It has twice the thickening oomph that wheat flour does, but it can also have the same starchy taste as flour unless it is cooked a bit. It cooks up clear. Starch from corn contains substances known as phospholipids, which can have a bit of an after taste; if you need to thicken something delicate tasting, considering using tapioca or arrowroot starch instead. Cornstarch is not considered kosher for Passover because it’s a grain, even though, being a New World food, it wasn’t one of the 5 grains originally forbidden during Passover. Rabbis have since “read it into” the list. Corn syrup is made from cornstarch — enzymes are added to break the starch down into sugars. Starch is just a bunch of glucose molecules strung together. Mix cornstarch first with cold water (equal amounts of each) before adding to a hot liquid, otherwise you will get lumps. Use 1 tbsp per 250 ml of liquid (1 cup / 8 oz) unless your recipe advises otherwise. Mix the 1 tbsp of cornstarch with 1 tbsp of cold water, then add the rest of the water. Cook for at least a minute to get rid of the raw taste, but no more than three minutes, because past that it starts to break down again. Don’t add anything acidic such as vinegar, wine or lemon juice, until after the cornstarch has thickened the liquid, or it won’t set. For fair-skinned people, a light dust of cornstarch is a good emergency substitute for concealer, particularly for dark circles under the eyes. Just rub on with the tip of a finger, then brush off lightly with a towel or brush. 1 tbsp cornstarch has the same thickening power as 2 tbsp of wheat flour. 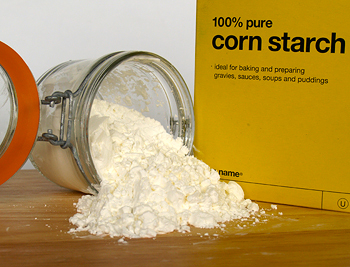 Cornstarch will keep indefinitely at room temperature in a sealed container. Try not to use it in something you are planning to freeze, as it tends to lose its thickening powers when frozen. Not that that matters while it’s all frozen solid, but it will when you thaw it. Brown & Polson in Paisley, Scotland have been selling Cornstarch since 1840. They call it “Cornflour.” During the “Emergency”, as the Irish called the Second World War, a special act was passed setting the maximum price for Brown & Polson Cornflour in Ireland at 5 pence a 1/4 pound package. It can also be spelled as two separate words (e.g. Corn Starch), but the one-word version is about 4 times more common.